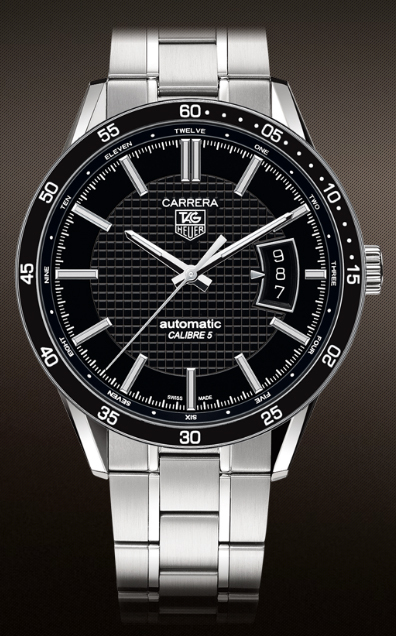 The Tag Heuer Carrera Calibre 5 Automatic Stainless Steel Black Dial Men’s Watch WV211N.BA0787 is stylish and handsome; a luxury timepiece for men who want precision and ease, without the clutter of chronograph sub-dials or extra gadgetry. This streamlined model from the Carrera Collection is free from mini-dials or extra weight, yet it is sturdy and durable, due to its stainless steel case, link bracelet, and bezel. The dial is also protected by sapphire crystal, which is highly resistant to scratches, while the anti-reflective coating ensures smooth readability without glare. This watch also features luminous hands, markers, and dial, making its display easily legible in low light or underwater. A date window, at the 3 o’clock position completes the appeal of this fine timepiece. Hours, minutes, or seconds are easily tracked without fuss. The bezel features large numerals marking the position of seconds in increments of five. The dial’s features include each hour marked by its name and a large steel baton, in addition to individual minute markers, and tiny indicators for every 15 seconds or 1/4 minute. A double marker indicates 12 o’clock. The minute, hour, and second hands are simple steel baton in shape. All hands and markers are luminous, as noted above. Inspired by the Carrera Pan-Americana Mexico Race of 1964, the Carrera line continues onward, with the clean and sporty lines of this watch, along with its easy readability. An added feature, with a bit of fun, is the sapphire crystal case back, which allows you to see the calibre 5 movement in action. Sapphire crystal case back allows you to view the watch movement in action. Calibre 5 automatic movement, Swiss made. Self-winding, with 38 hour power reserve. Round, black dial and bezel. Double security clasp bracelet, to 8″, with easy to use push buttons. Luminescent white or steel hands and indexes. Water resistant to 100 m. or 330 ft. Oversized screw-on crown, with 2 security gaskets. 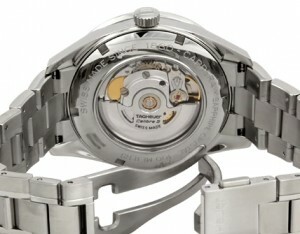 Open flange and markers on bezel make seconds easy to read. Scratch resistant sapphire crystal, for excellent durability. Sapphire crystal case back – reveals calibre 5 movement in action. Crown stamped with the Tag Heuer logo. Date display at 3 o’clock position. Potential drawbacks to this watch are very few. Curiously, this is the only model in the entire Carrera collection that is exclusively available with a stainless steel bracelet. The rest of the collection is variously available with calfskin, alligator, or rubber wristbands. This watch also does not come equipped with the chronograph sub dials that athletes find useful for timing trainings, nor is it suitable for diving to depths past 100 meters. If you are a diving or water sports enthusiast, the Aquaracer line would be more suitable for you. There is only one variation of this WV211N.BA0787 model available. 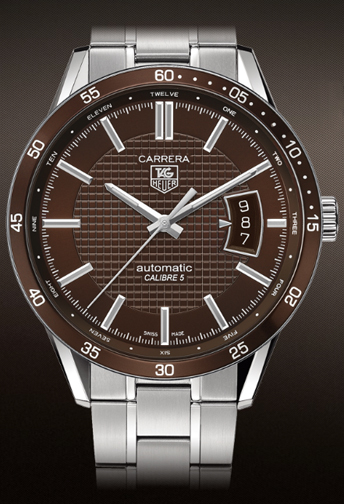 It features a brown dial, instead of black, but is identical in every other way. 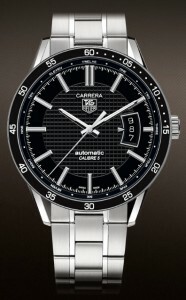 If you are interested in other Carrera watches with similar simplicity, you should check out the Calibre 7 Twin Time models, which can be viewed at TagHeuer.com. Pricing for this watch is $2600. However you may find a better deal online. There are several retailers, including Amazon, that offer this watch for sale. However, you should be aware that Tag Heuer highly recommends you take their watches to one of their own technicians for annual checkups, particularly with regard to their water resistant features.